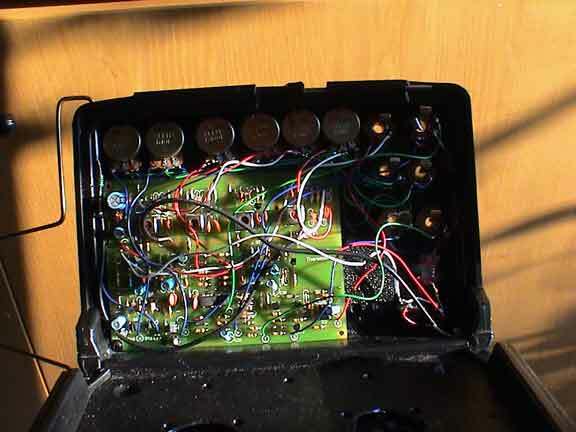 The Theremin is not my invention, but I did build this Theremax version from a kit made by Paia Electronics. It was actually invented in the 20's by Leon Theremin and nearly became a common instrument of today, (but it didn't) and was the first synthesizer ever built. 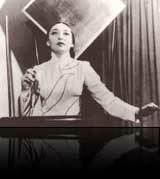 The really strange thing about the Theremin is that it's played via the electromagnetic field of your body, (or any other object that happens to pass in the sphere of control!). There are two antennae. 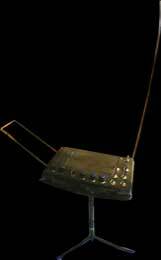 The rectangular antenna controls the volume and the long straight antenna controls the pitch. You play it by waving your hands through open space in proximity to the two antennas, henceforth it is very difficult to control, but not impossible. At times it can sound like a violin. Theremins were frequently used to make the spacey sound tracks for old science fiction movies. My Theremin is built into a video cassette box, folds up completely and runs on batteries. For more info about Theremins, check out www.thereminworld.com.